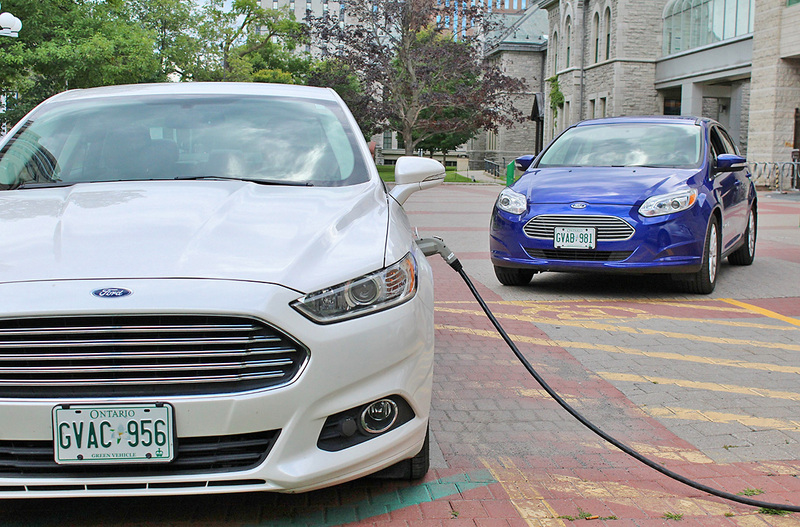 HomeLifestyleAutomotive2015 Ford Focus Electric: no gas, no problem? The Ford Focus is no stranger on the compact car scene, but one version of it stands apart from its gas-powered brothers. Imagine, for a second, that the engine of the popular compact was stripped out and replaced by a 107 kWh electric motor, and the cargo bay partially filled with a 23 kWh lithium-ion battery pack. Add a specialized grille to the otherwise normal 5-door body, and that’s what you have here. 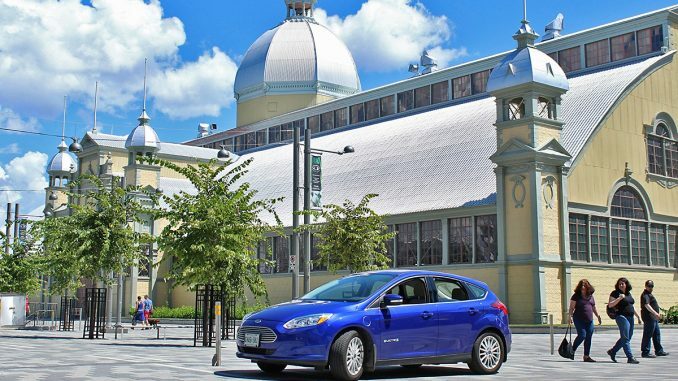 The Ford Focus Electric has been on the market since 2012, and is one of the few all-electric models available today–certainly, a rarity in the North American scene. This model does away with the range-extending on-board generators seen in more popular plug-in EVs, including those made by Ford (C-Max Energi, Fusion Energi), appealing instead to urban car buyers seeking a zero emission runabout. 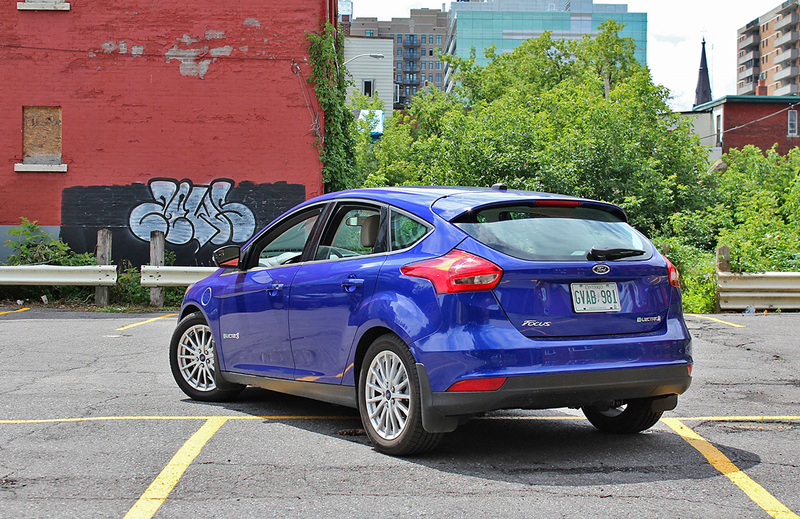 A long weekend in the city seemed as good an opportunity as any to put the Focus Electric through its paces, though the car’s EPA-certified range of 76 miles (122 km) made it clear that ‘range anxiety’ was going to join sunshine on the weekend’s forecast. More on that later. A previous test of a gas-powered Focus showed the compact to be a comfortable and sturdy little vehicle with good road manners. 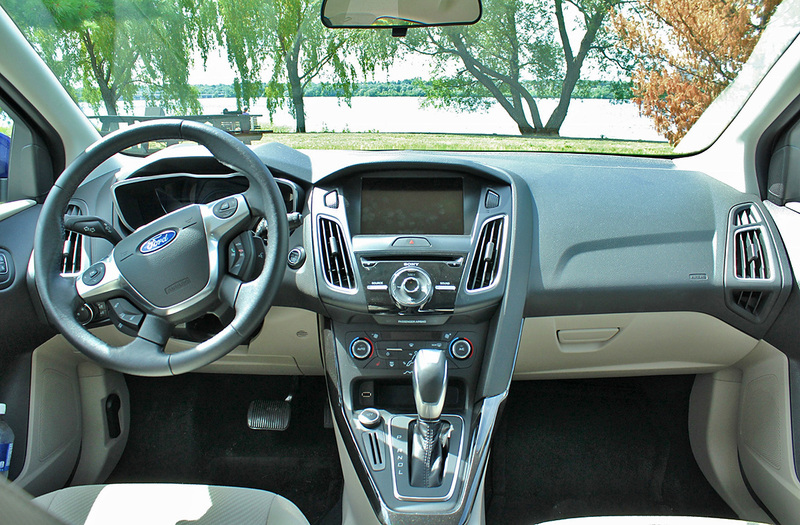 Those qualities don’t disappear just because a battery has replaced the fuel tank – the Focus Electric, with its mid-level trim and gadgetry, performed just fine. The battery adds about 300 kilograms (661 lbs) to the vehicle’s weight, but you’d likely only feel the difference if you took the car on the track. Taught steering and a compliant suspension did a good job of covering up any differences between the two. The Focus Electric boasts 143 horsepower and 184 lb-ft. of torque, seamlessly applied through a 1-speed automatic transmission. All that torque is available from a standstill (one of the great benefits of an electric motor), making the vehicle feel powerful and buttery smooth. Electric power really shines when pulling a passing manoeuvre or merging, as the Focus Electric rockets to its desired speed with enough force to push you back in your seat. It’s tempting to drive the car in a manner that would wring the most fun out of this motor, but hard acceleration comes at a price. Though the EPA says 122 km marks the end of the road, the Focus Electric showed ranges of 148 and 155 km after two recharging breaks. That’s an improvement, but nowhere near the nearly 500 km range offered by more expensive EVs like the Tesla Model S.
That said, the price of a Focus Electric ($32,505 in Canada, before applicable rebates) undercuts a base Model S by more than half. To make the most of the vehicle’s range, Ford uses an on-board ‘energy coach’ to monitor the braking, acceleration and cruising habits of the driver. It posts its findings on an electronic display next to the speedometer. 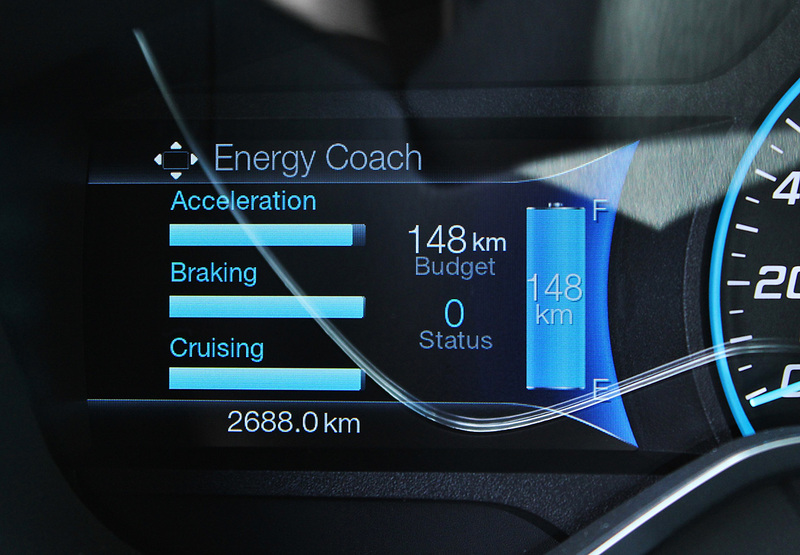 The amount of battery power recaptured through coasting and regenerative braking is also displayed next to a battery life indicator. While gas-powered vehicles get their best mileage on the highway, an EV is the complete opposite–highway trips sap range, while stoplight-to-stoplight city driving sees plenty of juice returned to the battery. It’s a shift in popular wisdom, but staying on busier streets helps the Focus Electric go the distance. With the battery indicator always counting down like sand through an hourglass, you’ll want to score high marks with the energy coach on an ongoing basis. Range anxiety–a psychological affliction born of electric vehicles–creeps in during moments when the vehicle consumes more power than budgeted for a trip. 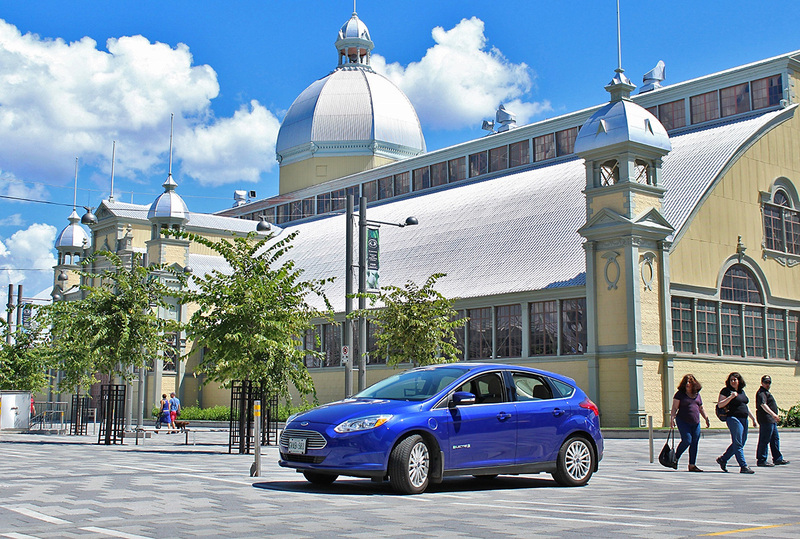 For example, on a 26 km trip from downtown to the suburbs by way of uncrowded parkways and greenbelt roads, the Focus Electric consumed 44 km of range, despite gentle acceleration and a light foot at cruising speed. A partial trip back of 16 km, through denser parts of the city that required more braking, saw just 3 km of range bleed off the battery indicator. It seems fickle, but this behavior is par for the course for an EV. Little changes on the road can make big differences in range, so it’s important to plan ahead and anticipate them. Charging the Focus Electric is a breeze if you have a 240-volt connection at home, as a full charge takes less than four hours. Otherwise, you’ll be spending the whole night plugged into a regular 120-volt wall outlet. This driver took advantage of public charging stations to keep the Focus on the road, though a few top-ups were accomplished at home with a 120-volt plug. The plug, which connects to a nifty glowing charging port on the driver’s side front fender, stows away in the hatch area of the car. 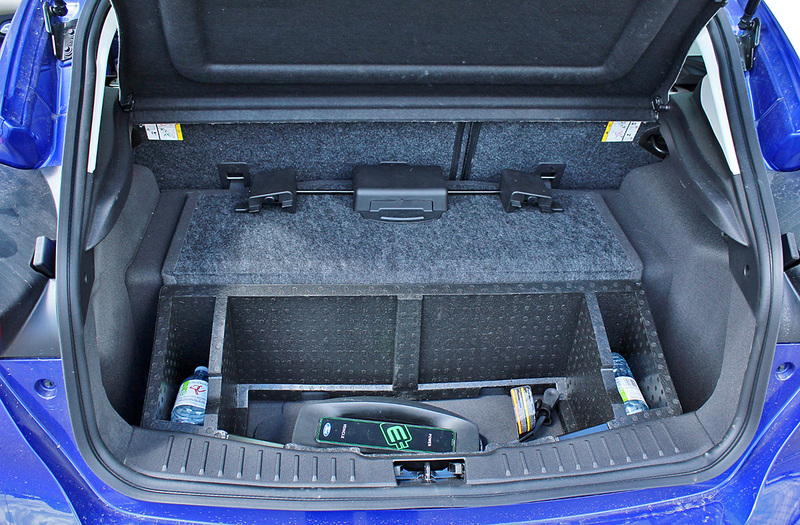 Because of the location of the battery behind the rear seats, cargo capacity inside that hatch is severely restricted. It’s hard to say if that would turn off some buyers, though in its defense, the car’s rear seats do fold down to make a flat cargo surface. In terms of viability, the Focus Electric exists to fill certain niches. Serving as a second car or a primary urban runabout, the vehicle works so long as the buyer is prepared to live within its limitations. In Canada, where gasoline prices always seem higher than what oil prices demand, it gives a driver some satisfaction to drive past the pumps without having to care about today’s fuel price or be concerned about tomorrow’s. I bought one of the first run Focus EVs in June of 2012. We live in a suburb of Rochester NY and find the car comment_content_IDeal for this mcomment_ID-size compact city. Range anxiety is not a problem as few round trips are more than 40 miles / 70 km. If we are making several stops we do sometimes use google maps to determine total length or shortest route. The car is a great car to drive. I’ll never go back to gas. We do have a gas Ford Focus Gas but it doesn’t get much use. My wife and I are usually able to arrange our schedules so that we can use the EV.